As I alluded to in yesterday's blog, while H5N8 was the `prime suspect' in the bird flu outbreak just reported in the Netherlands, over the past month we've seen the unexpected emergence of a reassorted H5N6 virus in the Far East (Japan, South Korea, Taiwan), and that its arrival in Europe could not be ruled out. Today, based on a report issued by the Wageningen Bioveterinary Research Institute, we learn that this latest outbreak is indeed due to a reassorted H5N6, which is described much in the same way as the viruses detected in recent weeks more than 9,000 miles to the east. Some excerpts from the statement, then I'll return with more. In Biddinghuizen (municipality of Dronten, Flevoland Province) bird flu has been demonstrated by Wageningen Bioveterinary Research (WBVR) at a company with meat ducks on Friday, December 8, 2017. The virus has been classified as a high pathogen H5N6. This company was also one of the first to be infected last year. A first genetic analysis shows that the virus is not related to the zoonotic H5N6 strain, which circulates in Asia and can also make people ill. The H5 is related to the highly pathogenic H5N8 virus that was found in the Netherlands in 2016. The N6 is related to low-pathogenic viruses previously found in wild birds in Europe. The H5N6 virus was created by exchange of genetic material, or reassortment. WBVR carries out follow-up research to gain further insight into the origin and genetic composition of this virus. To prevent further spread of the virus, the company is cleared by the Dutch Food and Consumer Product Safety Authority (NVWA). In total, about 16,000 meat ducks are involved. In the area of ​​one kilometer around the company in Biddinghuizen there are no other companies that have to be disposed of preventively. In the area of ​​three kilometers around the infected company, there are four other companies. These last poultry farms are sampled and examined by WBVR for avian influenza. WBVR will determine the characterization of the H5 avian influenza virus in follow-up research. Last winter's record setting avian epizootic in Europe was caused by the arrival of an (also recently reassorted) HPAI H5N8 virus, which spread rapidly across Western Europe, into the Middle East, and into Africa. 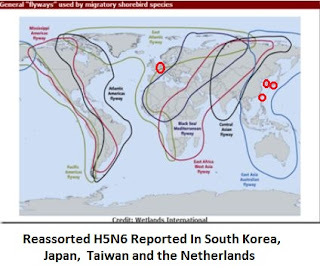 While 99% of the outbreaks were caused by this H5N8 virus, a small number of reassorted H5N5 viruses were detected; new reassortments spun off from H5N8. Towards the end of the season, a lone reassorted H5N6 virus (see CIDRAP: Greek H5N6 Virus Appears Distinct From Asian Strain) was also reported. At the time, this appeared to be an isolated incident. 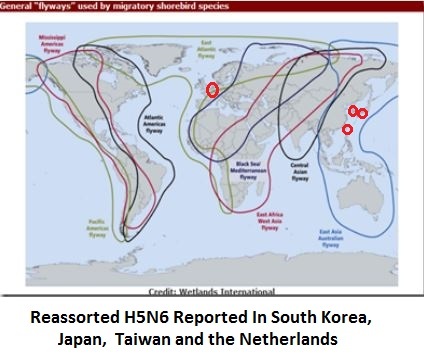 It now appears this reinvented `European' H5N6 virus was able to thrive and compete successfully with other avian viruses in migratory birds over the summer, and has become a new player in the evolution of HPAI H5. We'll have to wait for a full analysis to find out just how close this latest virus is to those detected in the Far East, but the preliminary description is very similar. Since H5N8 still circulates in Italy and Africa, and the Asian version of H5N6 continues to plague Chinese poultry, it is far too soon to declare this new H5N6 virus the new heir apparent in the bird flu world. But its ability to show up on two continents within a span of 3 weeks is pretty impressive. Avian flu continues to evolve at a rapid, and unpredictable rate. Unlike 6 years ago, when we really only had one HPAI avian flu virus (H5N1) to worry about, the roster of new viruses has grown to include H5N8, H5N6 (Asian), H5N6 (European), H5N5, and H7N9. Given the ability for avian viruses to swap gene segments, and to continually re-invent themselves, the expectation is that we'll see more reassortments emerge in the months and years ahead.